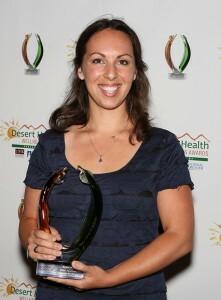 We are proud to recognize the winners of the first annual Desert Health® Wellness Awards. 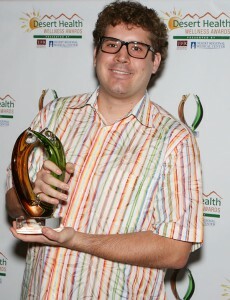 In a festive celebration on May 20, over 230 health-conscious guests including doctors, health coaches, fitness instructors and wellness fans gathered to learn which finalist would take home the stunning trophy presented to those making a positive impact on the health and wellness of our community. Winners included a landmark spa, a training center producing pro athletes, a local doctor who is prescribing wellness, a program that feeds thousands of Coachella Valley kids, and a non-profit that is saving lives started by a high school student. 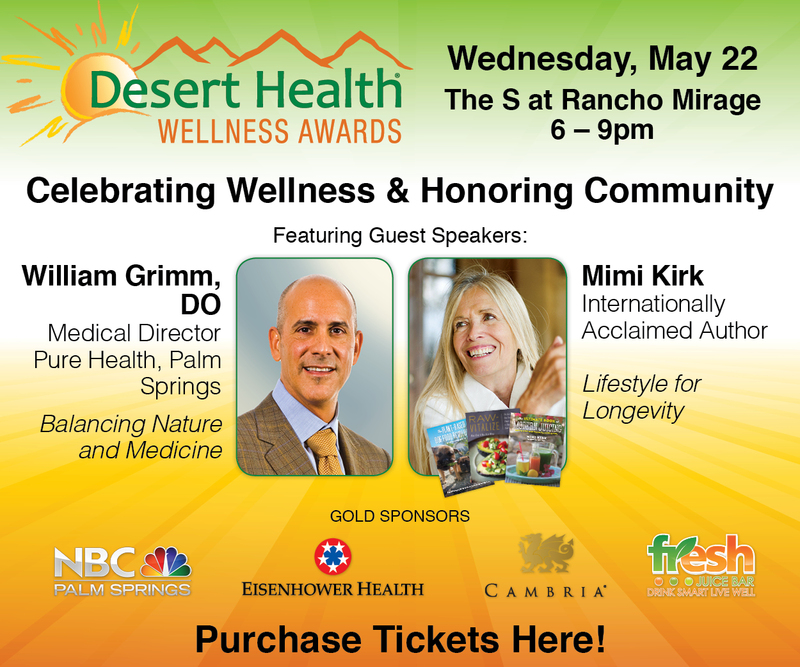 Presented by Desert Regional Medical Center and JFK Memorial Hospital, the Desert Health® Wellness Awards received over 50 nominations from peers and community supporters in five categories: large business, small business, individual, event or program, and non-profit. Three finalists were selected in each category and winners were announced at the event. The evening also featured integrative doctor and author Steven Gundry, M.D., who shared his personal journey from overweight surgeon to acclaimed preventative specialist and spoke on “The Future of Integrative Care in Medicine.” Special guests included 103-year-old Edith Morrey and entertainer Carol Channing, both who have been featured in Desert Health® for the nutritional choices which have contributed to their longevity. A silent auction benefiting Coachella Valley’s Volunteers in Medicine also helped to raise thousands for the valley’s only free medical clinic. 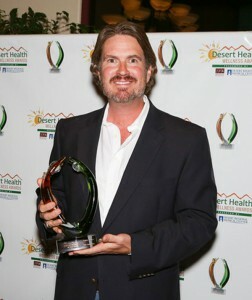 The Desert Health® Wellness Awards were established to further elevate the focus on health and wellness in the Coachella Valley, encouraging all to get involved, and awarding those who are making a difference. 2015 finalists included (in alphabetical order): Large Business: Massage Envy of the Coachella Valley, Two Bunch Palms, The Vintage Club of Indian Wells; Small Business: Kinetix Health and Performance, Klein and Clark Sports Production, Next Level Fitness; Non-Profit: The Melanoma Awareness Project of the Desert, Neighbors 4 Neighbors by Desert Village Initiative Sun City Palm Desert, Neuro Vitality Center (formerly the Stroke Recovery Center); Event or Program: The Drive Against Hunger Golf Tournament, FIND Food Bank’s Kids’ Summer Feeding Program, City of Palm Springs Mayor’s Healthy Planet, Healthy You Race and Wellness Festival; Individual Category: Jeralyn Brossfield, MD, Alexa Palmer, and Cathy Serif. 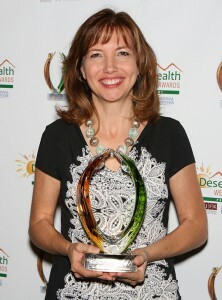 The challenging job of selecting winners belonged to the event’s executive committee, including Tricia Gehrlein, Clinton Health Matters Initiative; Donna Sturgeon, Coachella Valley Economic Partnership Health Council; Margot Nelligan, The Desert Look and Act for MS; and Lisa Ford, Desert Medical Imaging and Desert Valley Independent Physicians. This renowned resort destination located in Desert Hot Springs operates on four pillars: healing waters, therapeutic spa treatments, healthy cuisine and movement. Established in the 1930s, the resort has offered healing therapies to hundreds of thousands. Now in its 75th year, Two Bunch Palms has expanded their focus to incorporate community and natural resources. Their recent renovation added a 3.5- acre solar field dramatically reducing carbon emissions and water usage, and establishing Two Bunch as the first “Sustainable Wellness Resort” in North America, and the first carbon-neutral resort. Beyond their world-renowned waters, guests now enjoy over 35 wellness activities, such as meditation, art classes, tai chi, qigong and yoga in their beautiful new dome, and farm-to- table cuisine at their acclaimed restaurant, Essense. A legacy that spans several generations of guests—from notorious gangsters to Hollywood elite to romantic spa seekers — Two Bunch Palms is a gift to our community and now, to our environment. Kinetix is a state-of-the-art sports performance center in Palm Desert. Owners Michael and Susan Butler share a passion for both individualized fitness programs and youth enhancement and training. Their center offers top-of-the-line equipment and highly credentialed staff, as well as, a spa-like wellness wing for muscle and body work with many specialized services that have aided thousands back – or into – health. The Butlers have dedicated countless volunteer hours to local high school athletic programs and have proudly trained more than 70 athletes to either Division 1 or 2 scholarships, many who have turned pro. For the past 14 years, they have also operated youth sports performance camps which not only build athleticism but also character, through their focus on hard work and commitment to reaching goals. Mike is also on the board for two local high school health academies and on the medical staff for La Quinta football. Together Susan and Mike offer a free community lecture series on various health topics and conduct internships for students pursuing careers in Kinesiology. Each of the six persons who nominated Kinetix spoke of their dedication and tireless contribution to members of our community. In the Coachella Valley, 4 out of 5 school-age kids are eligible for free and reduced-price meal programs. So as schools let out for the summer and heat intensifies, so do the hunger pangs of many children who lose access to the meals and snacks they get at school. The result is a seasonal nutritional deficit that hinders academic, social, and personal growth for these students, year after year. To help fill this critical hunger gap, FIND has been building their summer programming to increase access to supplemental nutrition for low-income children and their families. By partnering with a growing number of organizations including the Boys & Girls Clubs, YMCAs, and low-income housing partners, FIND provides fresh produce and kid-friendly snacks for upwards of 11,000 children each summer. Their free and educational experiences include mini farmers markets which are often coupled with a cooking class and take-home menus for kids and their families. FIND Food Bank’s Kids’ Summer Feeding Program is focused on providing supplemental nutrition while creating a sense of community and allowing kids who face food insecurity to return to school ready to learn. As Medical Director at the Eisenhower Wellness Institute, Dr. Jeralyn Brossfield has integrated wellness programs such as yoga, qigong and meditation into the hospital setting. Under her leadership, Eisenhower now has a mind-body manager, and doctors and nurses are encouraged to take meditation breaks throughout the day. Her team manages required health screenings for employees with incentives and programs to improve health, and the hospital has even opened a yoga studio off campus for the entire community. Through the Wellness Institute, these services are offered to the entire community and start with education, which is Dr. Brossfield’s passion. She often speaks with students, organizations, and other practitioners on the importance of preventative health and its place in medicine. She also leads a team of Take Shape for Life Health Coaches who are committed to empowering individuals along their own path towards health. Dr. Brossfield feels honored to be in the position to create new ways to empower choices for wellness, and lucky to have the opportunity to set big goals which make a true difference for people in our community. After learning that 19 out of 20 melanoma deaths could possibly be prevented through education, William Lavin started MAP in 2008 while still in high school. With the goal of making a difference, he developed a website, a slideshow lecture, awareness bracelets and brochures targeting young people. The peer-to-peer program trains volunteer high schoolers who then reach out to others in high school and middle school. To date, MAP has educated over 14,000 students throughout the Coachella Valley. MAP has also been a great extracurricular activity for their young volunteers, helping them build friendships, become better public speakers, pursue their academic interests, and serve their local community. MAP fans include numerous doctors and countless self-diagnosed patients. Students often approach MAP volunteers to report that they have identified pre-cancerous moles thanks to the program. Wills Lavin also established free screening clinics targeting those without insurance. Thanks to this young man, what MAP does is without a doubt making a positive impact on preventing skin cancer in the Coachella Valley. 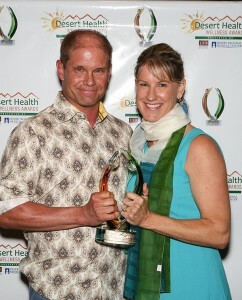 Nominations for the second annual Desert Health® Wellness Awards will be accepted starting September 1, 2015. The awards ceremony will take place May 18, 2016.